Many scientists believe that fat build-up in certain body parts is due to the habits individual’s have. If you want to lose weight, this is very important to know. Continue reading this article if you really want to lose weight since it will present you 5 significant weight loss rules. Try to follow these rules and you will get the long-desired results. When you are stressful, excess production of cortisol, the stress hormone, happens, and as a result of this you gain weight around your belly area. To reduce belly fat, we reccomend you Pilates and Yoga, in addition to foods rich in fiber, minerals and vitamins. Women mostly refer to these problematic areas as “critical zone”, since they are more affected by them then men. Fat deposits on abdomen, thights and buttocks are associated with lack of physical activity. So if you are one of those women, in order to achieve the desired results, start with circular trainings, lower body workout and cycling. 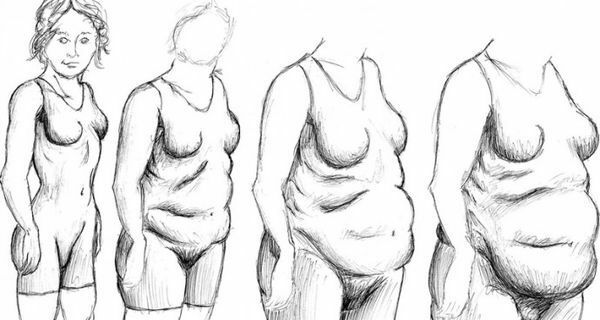 As we previously mentioned, the women are most affected by weight gain in the lower body areas. The best way to reduce fat deposits in these areas is by cycling. People who love eating unhealthy food and don’t exercise, have to face with fat deposits on their back, forearms, hands, belly or chest. If they want to reduce the unwanted fat, they shoul definitely consider changing the diet and start consuming 500-1000 calories daily, along with exercising 5 times a week for 30 to 60 minutes.The ideal exercises for the upper body are cardio, push-ups and sit-ups. Consuming junk food, skipping meals and oveareating later are all indications of the presence of fat deposits around these areas. Not exercising is yet another indication. If that is the case, then you should start consuming more healthy food, taking 5 smaller meals throughout the day. You should also make sure that the meals have more nutrities instead of calories. Engage in physical activities like swimming, walking or running.